The goal of our music ministry team is to glorify God through singing and playing music. We believe music is a gift from God, and it is a joy to share this with our church family. We hope that those who listen will find a closer relationship with Him. We have many opportunities for you to join us! The Chancel Choir is made up of individuals who find joy in singing for the glory of God. 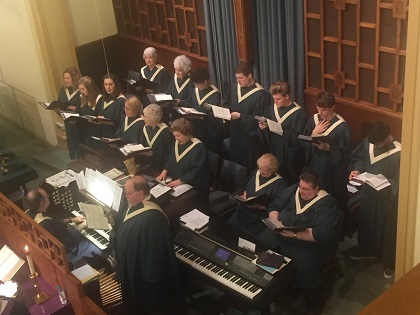 The music we perform ranges from standard hymns and hymn arrangements to contemporary Christian favorites. 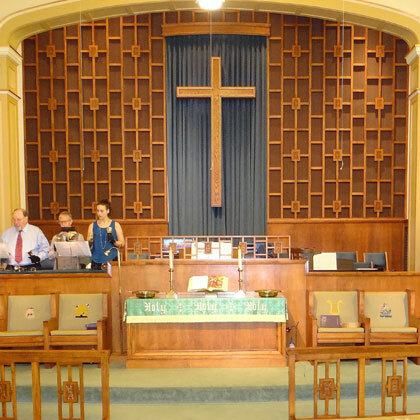 The choir meets on Wednesday evenings at 7 p.m. and sings during the 11 a.m. service. The choir also performs cantatas for Christmas. Everyone is welcome to sing in these special events. 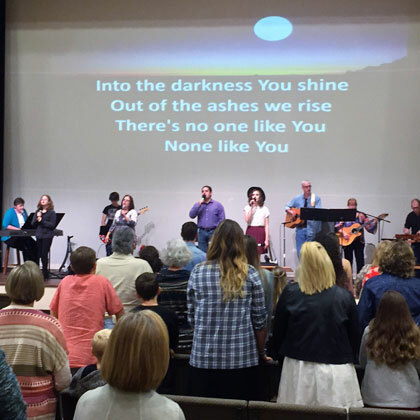 The Praise Team leads music through the singing of contemporary praise and worship songs at our 9 a.m. service. They rehearse on Wednesday evenings. If you are interested in being a part of the Praise Team, contact the church office and set up a time to meet with the team for a brief audition. The Praise Team needs individuals who can sing harmony, work well with others and who wish to enhance the worship experience by leading others in praising God through song. The bell choir currently plays two- and three-octave music and is hoping to expand. To join, all you need is a love of music and a basic understanding of music theory. The hand bells meet Wednesday evenings from 6-7 p.m. and play during the 11 a.m. service. First Methodist Kids performs during the worship services periodically during the year. During December and May, they perform a musical or drama. They meet each Sunday night from 5-7 p.m. during the school year. Our audio/visual team plays an important role in enhancing the worship experience through sight and sound. If you have basic knowledge of using a computer and/or have ever worked with a sound board, contact the church office.